Four Kilometers from Kumbhakonam city. 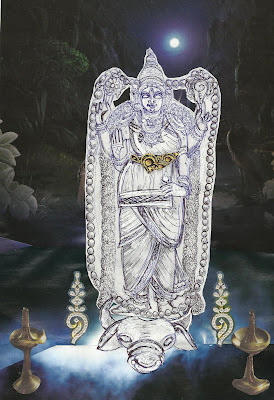 Sanctified as a " Paadal Petra Sthalam" , located on South side of River Kaveri. 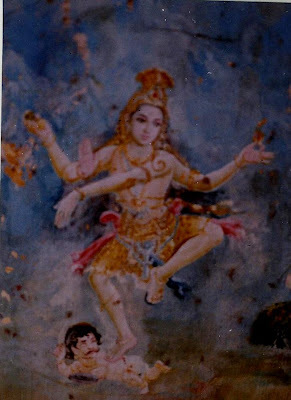 Associated with Kulotthunga Chozhan and Varaguna Pandyan. Small town with the sprawling temple complex as its focal point. The broad, straight avenue leading from temple to the Theradi ( the chariot shed) is immortalised in a proverb as the epitome of excellence ( though now, its just another road): " Thiruvaroor ther azhagu, thiruvidaimaruthur veethi azhagu ". The huge temple complex forms the heart or garbhagriha of a "punya desa" covering nine towns each enshrining one parivaara devata ( attendent deities) usually seen in Shiva Temples. Consequently, the deity here is revered as the " Maha "-lingam. The size of the lingam is also quite "Maha". 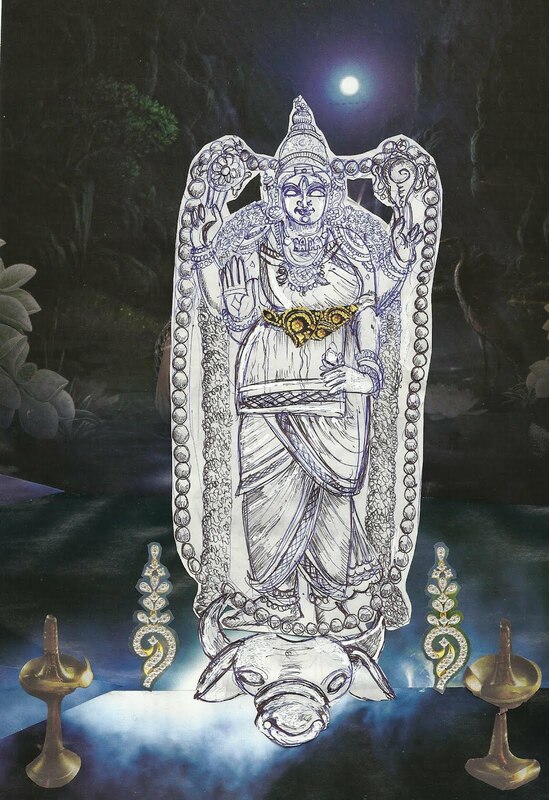 A bronze figure of the Lamp-Lady ( Vilakku Paavai ) serving the deity is a stunning creation and virtually a guide to the ornaments of ancient India. Interestingly there are two Ambikas for the lord here, each with her own shrine. One is named Brihath Sundara kuchambikai and the other, Mookambikai, the latter housed under a north Indian style pagoda. The Nandi also deserves the "Maha " label here ! The vastness of the temple comes from the three encircling circumambulatory corridors called Ashwamedha Prakaram, Kodumudi Prakaram and Pranava Prakaram. There are doorways leading off into one another to reach the various sannadhis, wells, ponds, holy trees etc. and unless one is well acquainted with the place, one is bound to feel as though trapped in a maze. Nevertheless it is well worth the effort to amble through all corridors, as many interesting things can be seen scattered around : like, the Lion Well . A wonderful sculpture of Ravana lifting Kailas. A spot in the wall where the deep chant ( hum or reverberation) of the OM sound is heard. 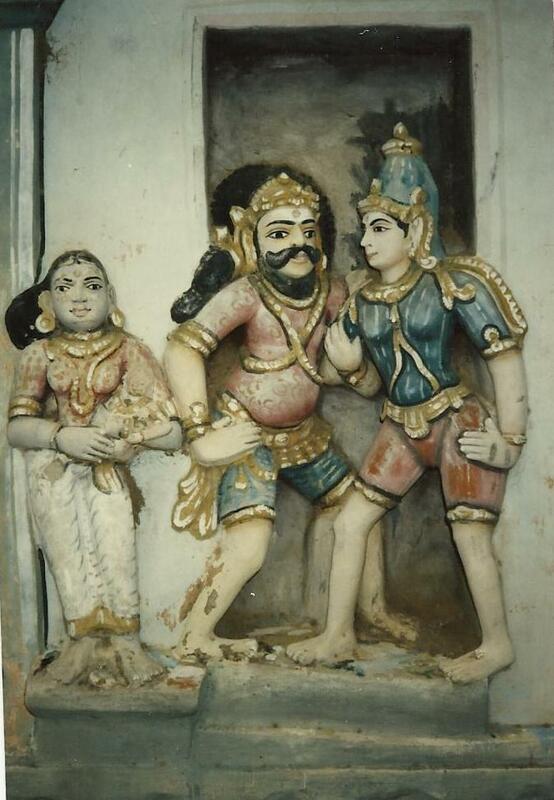 The Chitra Salai or Art Gallery is kept locked behind grill doors and special permission is needed to visit it. This measure was enforced after the temple authorities realised that the priceless murals and stucco figures adorning the walls were being vandalised by the pilgrim hoards in the name of blind worship. Just as well. The Stucco ( or Suthai) works are older, jaunty, full of verve and bring alive various episodes from mythology. Stucco work is a very ancient form of decoration that falls between sculpture and clay modelling. Traditionally, a mixture of Lime, Jaggery , rice starch and straw mulch was used over an armature of burnt bricks and wood. 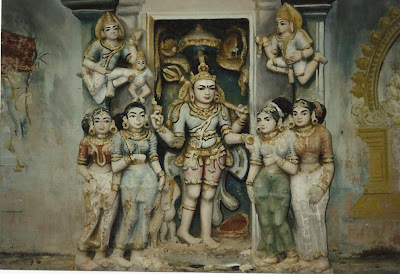 This art , taken to the Far East countries, reached its zenith of finess and exquisite exposition in the Wats and Puras of Thailand, Bali and Cambodia. 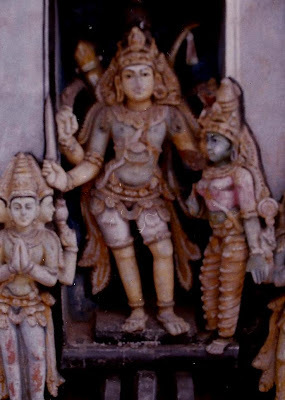 Hindu temples continue to have Stucco decorations to this day, but now the Lime mortar is replaced by cement. A visit to the chitrasalai is a truly rewarding experience. The temple pond here is large and inviting. In fact the environs are so pretty that cinema companies have started shooting movies here ! Which is a pity really. In March this year, a tamil movie crew shot here extensively and unfortunately included a senseless fight scene involving granades and smoke bombs. Reportedly, the debris was left uncleared. This is a great risk to the fragile cultural treasures we have here and authorities should put a stop to such episodes, even if the money offered for use of location is attractive. The temple has reportedly yielded many inscriptions of great epigraphical value. There's also a funny legend attached to the shrine. At the main entrance, just before entering the shrine proper, there's a small, dark, cave- like niche on the left side which can be accessed by a narrow, crude set of steps. Inside the cramped burrow, just faintly visible, is a figure crouched in foetal position. This is the "Brahmahatthi" demon, the personification of that heinous crime ; he is supposed to be lying in wait there for his target, a hapless king who fled into the shrine seeking the Lord's protection . Assured of divine help, the king left by the back gate, while the clueless demon continues to wait by the door for him to come out . So all ye who come out after worship , beware ! Dont look back ! For then, the dumb demon will pounce on you thinking you are that king nervously watching out for him, even if you are in Levi Strauss or a polyester saree and are one millenium late ! When one was a child, what a delicious sense of terror this dark niche evoked and what a grand war of will over temptation to throw half a glance over the shoulder at the eternally waiting goblin ! The ancestral village Thiruvidaimaruthur often becomes the base camp for visiting other religious architectural wonders strewn around a 50km. radius. So many are in ruins. Yet , hundreds of temples are in good condition too. Amazing, the temple building frenzy of our forefathers ! Patteeswaram is one of the better maintained temples. Formerly it was a part of Pazhaiyarai, the capital of the mighty Chozhas and has much historical value. 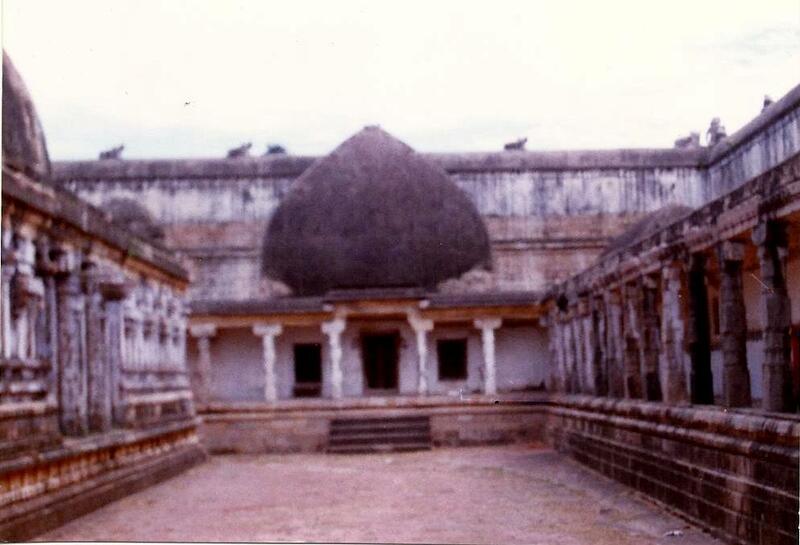 It was the place of miracles witnessed by the Shaivite savant , Gnanasambandan. Thel latter's shrine is a treasure house of sculptures and murals. 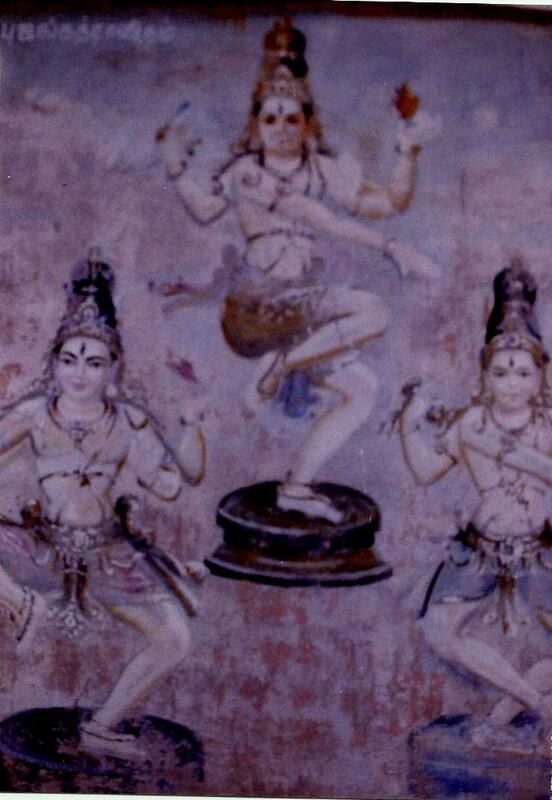 But sadly, seepage of rainwater and sheer neglect have damaged these magnificent murals beyond repair. The star of the place is Vishnu Durga, a lifesized sculpture near the north gopuram. She was brought here from Chozhar Maligai and has been the Guardian deity of the warriors. Beautifully proportioned, adorned with a garland of lemons and standing on a buffalo head, she is an epitome of both grace and strength. A dynamic lady indeed. I like this write up. Addresses the temple a little differently from the way I do. Really nice...have to read through it again. Refreshing memories of 'tirudamaddur'( as we used to pronunce when we were young).Wish to visit the oor once again.